To quote Charles Dickens, is it the best of times or the worst of times? Well, for leading sales executives there has never been a greater opportunity to convert their organization's top challenges into decisive opportunities they can leverage to gain measurable competitive advantage. 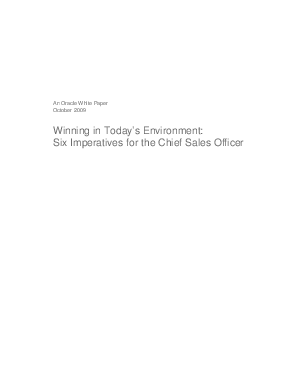 Download the Oracle CRM White Paper, "Winning in Today's Environment: Six Imperatives for the Chief Sales Officer," to learn how you can deploy several best practices to achieve unparalleled sales success in your organization.